Too bad that the weekend is over but I have something sugar sweet for you for this evening so that you don't have to think about Monday. 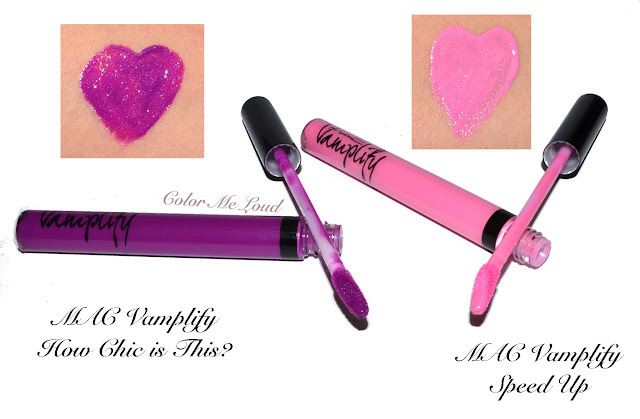 MAC recently released liquid lipsticks with a fun name, Vamplify! Each time I write this, I have a hard time with the auto correct which wants to change it to Amplify. That would be correct too since these are amplified versions of glosses in a way. There are seventeen shades available in Germany, I would like to show you two of them, called How Chic Is This? and Speed Up. MAC Vamplify How Chic Is This? is a gorgeous purple which reflects the light in a pretty way. I don't see any shimmer in there but it is glossy. The formula is close to MAC Lipglass, less sticky, and much more pigmented. On the lips How Chic Is This looks like a lipstick topped with a lipgloss. Who wouldn't like this effect? Here is MAC Vamplify Speed Up on me. When I was editing photos, I was like "OMG I look terrible" and hubby was like "hey you look so pretty in that one". Go figure! I believe somehow with the tan and pink dress it is wearable. Still I am not sure if I would walk out of the door like this. What do you think? Melanie here wrote this is close to what you can get with Speed Up and it cracked me up! 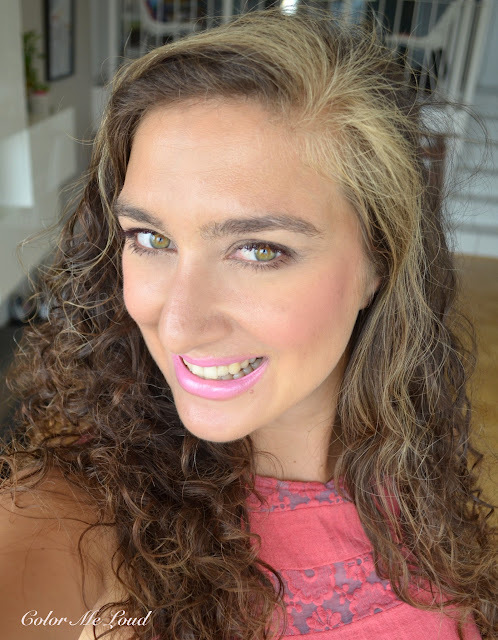 ;-) Here you can find some tips on how to wear pale pink lipsticks. Final thoughts: I am not a lip gloss girl but I like the intensity, the glossy finish and comfortable and long wear of new gloss/liquid lipsticks of MAC called Vamplify. I have to yet try more shades out in person but I know for sure that How Chic Is This? will be one of my favorites this season. 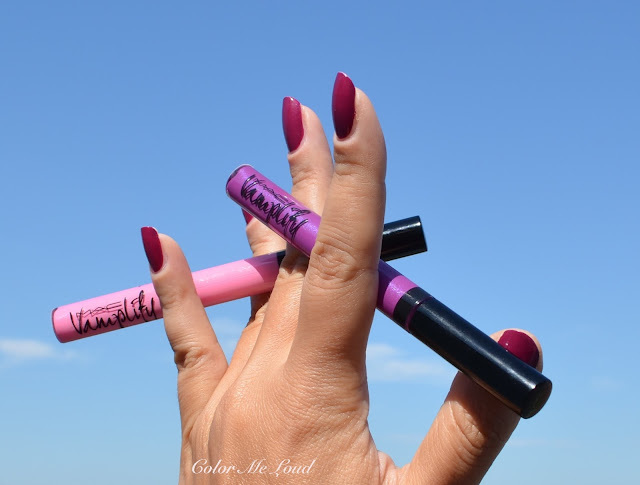 Have you checked out Vamplify Lip Glosses? How do you feel about lip glosses which packs lots of pigment? I need to know staying power, wear time, eating... is any gloss left afterwards? I haven't found anything yet that beats Kat VonD's liquid lipsticks. after eating some gloss remains on my lips. It depends on what you eat and how you eat though. For example if I eat salat with lots of olive oil, almost no lipstick can survive it. I haven't tried Kat Von D's, Vamplify is rather a thick formula, which is not drying, long lasting and slightly sticky. Does that sound like Kat Von D? Hey Sara, OK just to be honest: Speed Up isn't my thing. Objectively tho it doesn't look bad on you! How Chic Is This is totally amazing! I didn't even have to see a full face shot to know it'll look really good on you! Of course How Chic is more your color. And I'll be in the minority and say that I like Speed Up on you. It's more our concept or sense about what is acceptable and what is not. I actually find it more flattering than a blackened lipstick-- especially with a tan. I see it as very early 60's. 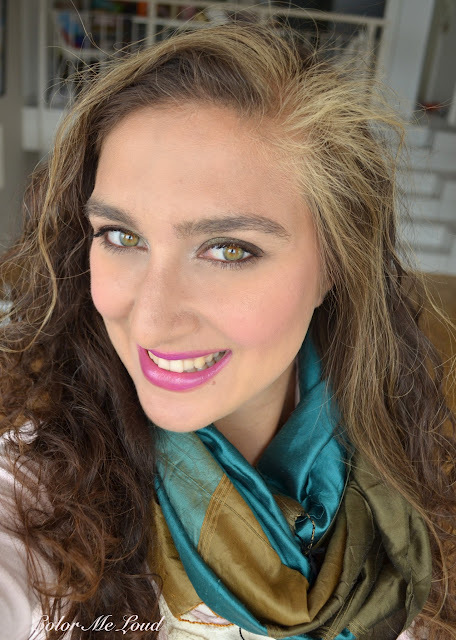 And I understand your hesitation because I have a few liquid lipsticks in these very whitened colors and I feel a bit mixed about them on me. And my husband likes them. Oh how chic do you look in that How Chic Is This? fotd!! Your eyes never looked more green! I wonder how How Chic Is This compares to Heroine and Speed Up to Saint Germain. They have to be pretty close! :) I personally love How Chic Is This so much on you. I'm still unsure about Speed Up... maybe it needs to be paired with a super dark smokey eye and dress? LOL. It's definitely the harder color to puff off! Hahaha you cracked me up! Yes I hate it as well. I think if someone is very blond but with a tan and gorgeously young and effortlessly beautiful, it is somehow possible to wear it. But then again there would be more flattering shades to wear ;-)) You are right about tastes and colors! I don't own the gloss of the heroine and the lipstick is a whole other story. I think Heroine has more red in there compared to How Chic but you are right, they are sort of close. In that link I posted it was advised to wear those shades with black liner and almost no make-up. I think being tanned helps but doesn't rescue the situation fully in my case haha! LOL, thanks. Yes when I received the mail I was like "yes my shade!" without even trying it on ;-)) That said sometimes purples miserably fail on me too, couldn't yet figure out why. How chic is this? It's super chic, I love your hand shot! And that color looks amazing on you. you are so right, with a tan blackened lipstick looks awful haha. I personally don't like super black lipsticks either. It is fun to hear your husband likes it too, mine liked this one and I couldn't understand why. It shows that sometimes what woman and man like can be very different. thanks for your lovely comment. I think Speed Up would look much better on you. It needs blonde hair and a touch of tan to work.